Small Business Solar Power in Portland Oregon? Good idea? Absolutely! State and government incentives, coupled with net-metering laws make solar such an accessible option. Additionally, if financed with an energy efficient loan or mortgage, the monthly loan costs are usually less than the monthly savings from implementing the system. Additionally, current utility rates are just that. They are current – meaning they have been a lot lower in the past and there is no reason to believe they will be decreasing any time in the near future unless you start generating some of your own power. Below, you can see the average cost of energy per kilowatt hour in California. Over the past 30 years, this rate has increased at 6.7% per year. 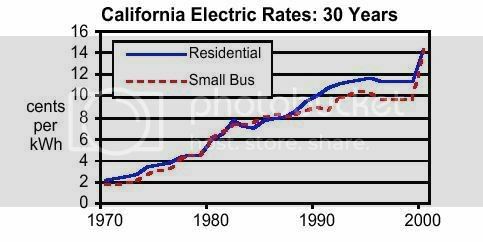 By getting ahead of the curve and going solar, small businesses can lock in future energy costs over several decades that are significantly lower than they are currently paying. Remember how many of the airlines were having severe problems maintaining profitability after fuel hikes in the past 5 years? United filed for bankruptcy, Delta almost tanked, and others like America West and US Airways had to merge with each other to stay afloat. Southwest was the only airline that made it through the continuing price surge. Why? Because they locked in the price of fuel years ahead of time at a good rate. Don’t be the next United Airlines. Even if you don’t have pensions to sever, the money you save can be used for other things- like your bottom line. What is the name of the cheapest solar stock?